... Michele, Paola, Federica, Jacopo (one and a half years old) and Niccolò (three and a half years old), each of them with their own personal contribution and passion. If you ask Niccolò what is his daddy's job, he will answer: “My daddy tells stories and send the filastoffe”. “Aunt Paola uses her hand calculator and speaks with customers”, “ Mummy dresses Jacopo, takes me to the nursery school and then helps daddy”. We could have identified ourselves with high-sounding titles such as “product manager“,” marketing manager” and “responsible for the logistics”, but we prefer to speak the language of kids, just like our accessories. Creativity and professional competence have been handed on from generation to generation for over 60 years and are always renewed in a natural exchange of knowledge and abilities. 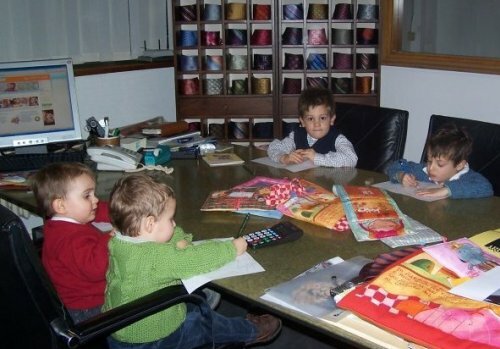 So, le Filastoffe translate the experience of the Pianezza Family in the textile field into a line of original and coloured articles for early childhood. le Filastoffe - produced and distributed by Pianezza Paolo s.r.l.